If you've ever been to a beer tasting, a brewer's dinner or brewery tour, you're likely already a craft beer fan. But there's a good chance you had no idea what the hell your guide was talking about most of the time. 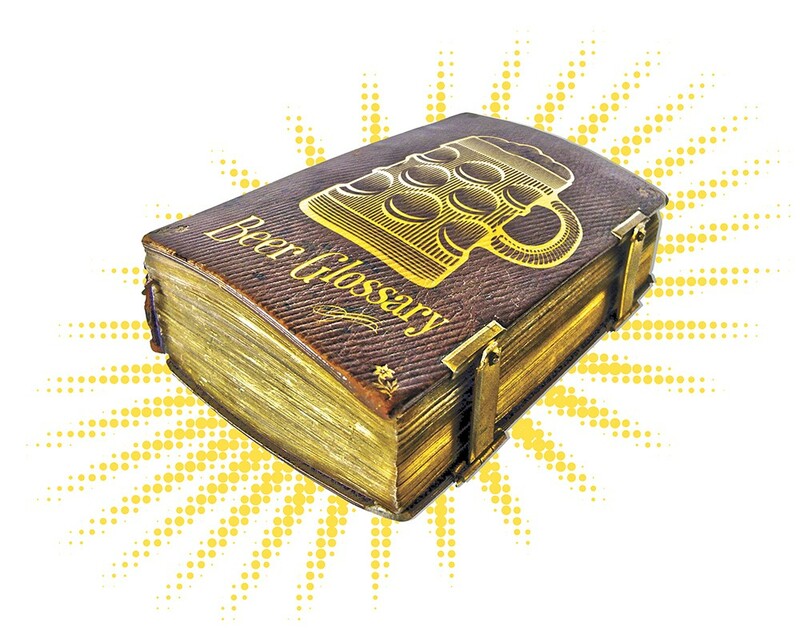 Brewing is a science, and the beer world is a vast, esoteric landscape full of so many terms that it's easy to keep your mouth in your pint glass, rather than ask what a mash tun is or inquire as to what those IBU figures on the side of the bottle mean. With Craft Beer Week (May 12-18) here this week, perhaps it's time you went to school. We've rounded up some expert advice from near and far to help you become more fluent in brew-ese. Here's an abridged glossary of the more elusive terms to keep on hand. A beer that's aged for several months or longer in a barrel, typically one that's been previously used for wine or liquor. In rare circumstances, a new barrel is used. The slang term for a 22-ounce bottle of beer. This is how many small brewers break into retail sales before moving onto six-packs or cans. A glass vessel often used for fermentation in the homebrewing process. Beer that is carbonated naturally with no artificial carbon dioxide. An expert on beer styles and how the beer should be served and stored. Manito Tap House founder Patrick McPherson earned his cicerone certification about two years ago. It's like a beer bar exam. "It's a four-hour exam. You have somewhere around 150 questions, and then there's 12 tastings you have to do. Oh, and there's three essays," says McPherson of the proctored exam, which will be administered on May 12 in Post Falls. Two Manito employees are studying for that test. A beer that has had hops added to it late in the brewing process, with the intention of adding more hop taste and aroma. "I would say that almost every modern West Coast IPA is dry hopped," says McPherson. A 10.8-gallon container used for specialty beers. "Typically firkins are cask conditioned, and you pound a tap through it and then pour beer out of it," says McPherson, who places his firkin on the bar top, per custom, for special events. The term for a half-firkin, if you were wondering, is a pin. "Plain water has a zero gravity. So when you measure the gravity of the beer when it's done, it's essentially how much dissolved material is in it," says Orlison Brewing Co. operations manager and brewer Mark Borland. Ground malts and grains, the first step of the brewing process. International Bitterness Unit: a measurement for the bitterness of a beer. The statistic is actually the measurement of alpha acid per liter of beer. "The stronger the IBUs, the more alpha acids it's going to have. But this has nothing to do with alcohol levels," says Borland. A loose term that implies a high-alcohol beer. "It's kind of arbitrary. Sometimes they'll say imperial, but it's interchangeable with 'double,' 'extra,' 'extreme' or any variety of adjectives. 'Double' or 'trippel' are terms you'll hear, too," says McPherson. India Pale Ale. You should know this one if you live in the Northwest. These hoppy ales are among the most popular craft beer styles. According to Martyn Cornell, the author of Amber, Gold & Black: The History of Britain's Great Beers, IPAs were first brewed in the 1760s because brewers believed beers shipped to warmer climates (i.e., India) needed more hops. He goes on to say that other beers, like porters and lagers, were already shipped to these regions for many years, casting doubt on the scientific validity of that claim. The pattern on a glass left by a beer's foam as it's consumed. Lacing is often a part of the judging criteria in beer contests. Grains that have been germinated and put through a process that produces fermentable sugars. The vessel in which the grist meets hot water, extracting all the needed chemicals and colors from the ingredients. "In the mash tun, you are breaking down the starches into complex sugars. This is where the wort is produced," says Borland. Beer that has been exposed to light (often in clear or green bottles), giving it a nasty aroma and taste. A tasting in which the same beer, but from different years, is served — i.e., a Deschutes Abyss from 2011, 2012 and 2013. "I've got a cellar with 50 kegs. I've got one from 2011 that we're saving for our 10-year anniversary," says McPherson. Craft Beer Week is celebrated nationally May 12-18 • Manito Tap House celebrates with a tasting of Perry Street Brewing's double IPA on Wed, May 14, at 6 pm, and the launch of Ramblin' Road Brewery's Belgian quad on Thu, May 15, at 6 pm.